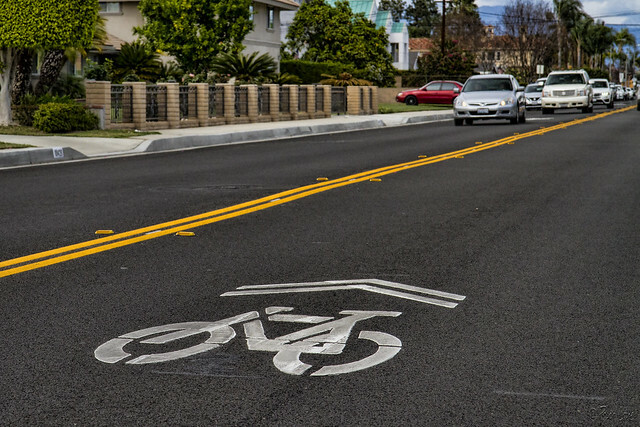 The recent resurfacing of Brookshire Ave. introduced bike lanes to Downey. But I've been puzzling about the different options, so I did some googling and learned a new word. 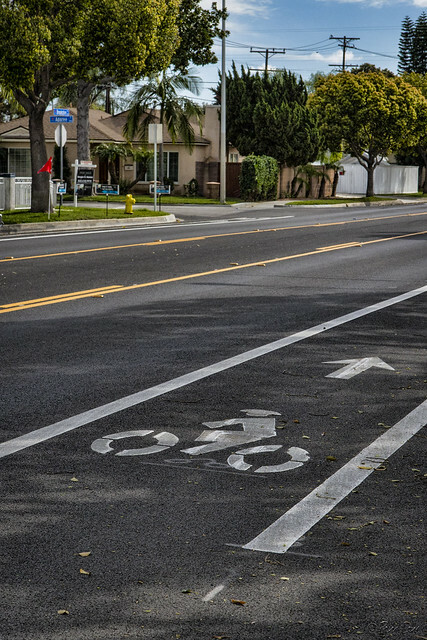 A desigated bike lane is indicated by a solid white line and a bike symbol, like the picture to the right. You can't drive in a designated bike lane. But what about when there is a bike symbol in the middle of what looks like a regular car lane, like the picture at top? It turns out that these are lanes that are shared by both cars and bikes. Those bike symbols with the chevron-shaped lines on top are called sharrows. Sharrows are used to alert other traffic that bicyclists are allowed to occupy this travel lane. I think this is still a little confusing, because technically bicyclists can share the right lane even if it's not marked with a sharrow. But I guess it serves as a reminder to be especially watchful for bikes on this street. If you are passing bicycle traffic, pass with at least 3 feet between your vehicle and the bicyclist, when safe to do so. When making a right turn, enter the bicycle lane no more than 200 feet before the corner or other driveway entrance. Do not drive in the bicycle lane at any other time. And even if there isn't a bike lane, watch out for bikes.